Meaning of Broadsword - it was a sword with a broad blade and usually two lethal cutting edges. The Broadsword was used to cut rather than stab. 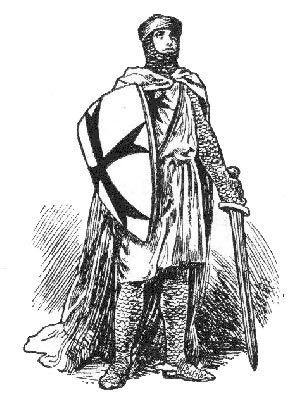 The Broadsword was predominantly used by a Medieval Knight. The weapons, armor and horse of the Knight were extremely expensive - the fighting power of just one knight was worth 10 ordinary soldiers. The confusion arose over the meaning of the term baskethilt broadsword when museum curators and other experts began to use the term to refer to the medieval arming sword enabling them to be distinguished from the slimmer blades of the rapier, smallsword and épée. This definition of the baskethilt broadsword is still the one most commonly understood. Skill in the use of Medieval weapons and understanding the strategy of Medieval Warfare was necessary and a played a vital part in Medieval life. The broadsword training required by a Knight was extremely time consuming - it was necessary for them to become expert swordsmen. Skill in using Medieval weapons, including broadsword training was necessary for every Medieval Knight. A Knight was trained first as a Page from the age of 7 to 14 and then as Squire from the age of 14 to 21. Special places were assigned for Broadsword training called the Pell. Pell training allowed knights to practise various vicious strokes and manoeuvres during their Broadsword training such as thrusting, cutting, and slicing without imposing an injury on his opponent. Each section of Middle Ages Weapons provides interesting facts and information about Medieval warfare in addition to the Broadsword. The Sitemap provides full details of all of the information and facts provided about the fascinating subject of the Medieval period of the Middle Ages!